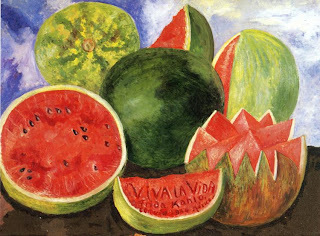 Frida Kahlo is a favorite of mine, but the pain in much of her art (& heart) can be a scary subject for kids. 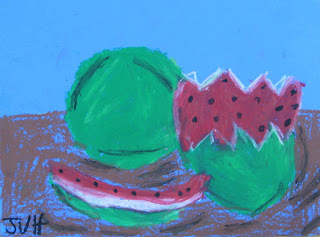 Then, when I came across a Frida mural lesson that Laura had posted on her wonderful blog called Painted Paper, I was inspired to do melon still lifes with my students based on Frida's painting called Viva la Vida. 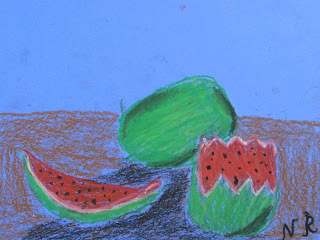 This lesson was done with white crayon and oil pastels on blue paper. 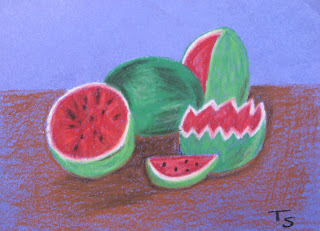 Because of time, we only did three melons. 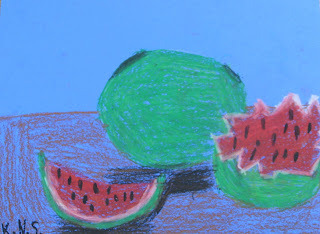 First we drew our still life with pencil on scratch paper. 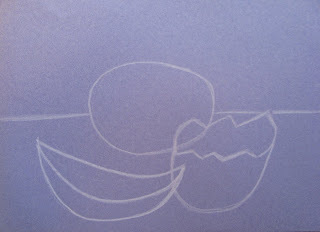 Then we drew our still life with a white crayon on blue paper. 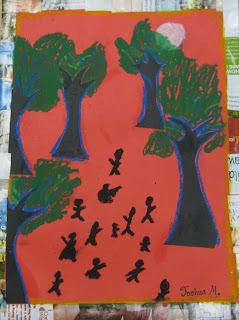 The white crayon doesn't show under the pastels and it saves the kids from making messy art because a number of kids get carried away erasing too many lines. 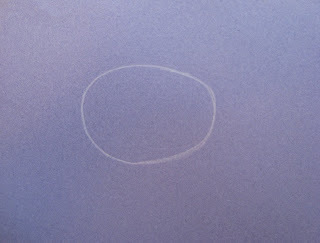 Step 1: Large oval for back melon. 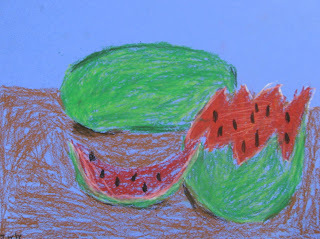 Step 2: Add an "open mouth with jagged teeth" for the top of the open melon. 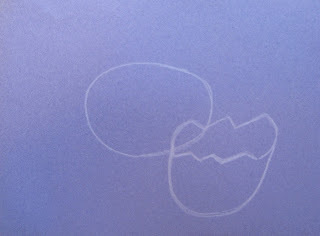 Step 3: Draw a "U" shape under jagged-teeth mouth. 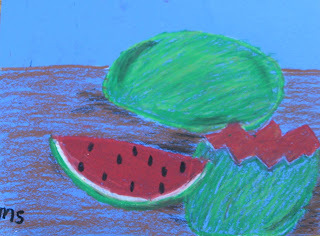 Step 4: Draw slice of watermelon in front. Step 5: Add table line in the background. Great Job Santa Rosa Academic Academy, 2nd, 3rd, & 4th graders!!! 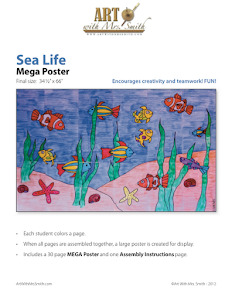 This lesson is simple drawing and collage. 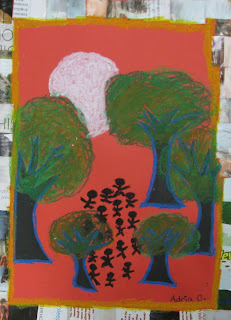 It's based on the art piece by Faith Ringgold titled "Coming to Jones Road #4 -Under a Blood Red Sky". 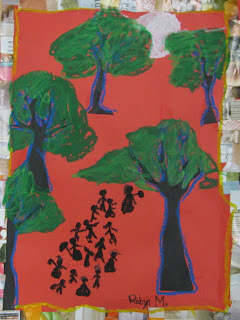 It depicts African American slaves sneaking their way through the night, travelling north to freedom. 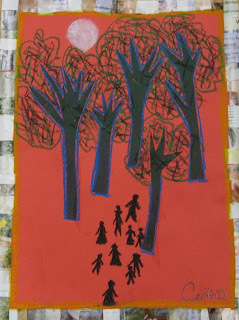 We used red background paper, cut out & glued on black paper tree trunks, colored the moon - trees- and people with pastels, then glued magazines pieces around the border for a quilted look. Thank you Flamson Middle School students. 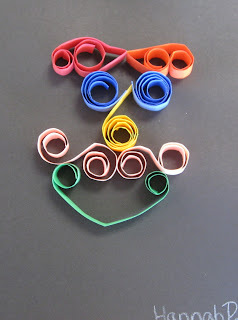 Schlepping my art materials from one classroom to another brought me a smile today. A girl called out from the playground, "Hi Mrs. Smith. We're walking California!" I asked, "What's walking California?" She said, "Our teacher told us the distance across California and we do laps around the playground and at the end of the year some of us will have walked all the way across California!" Then she went back to skipping around the playground. 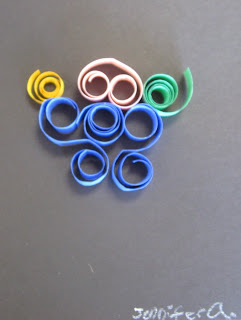 Now I'm inspired to have my youngest students paint some blobs, then have my older students turn them into "things". Ha, collaborative art is so easy to think of and so hard to execute when it comes to scheduling....we'll see, wish me luck! Curator/Fellow for Research in Indian, Persian, and Mohammedan art in the Museum of Fine Arts, Boston. Hard to believe this time last year I didn't really know what a "blog" was. Now I'm hooked on blogs! 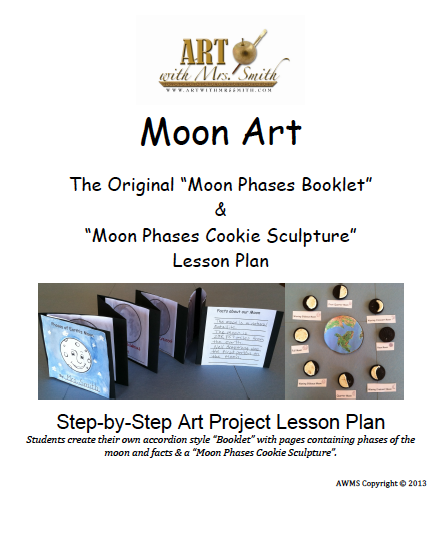 When I came across Anne Harwell's blog (love it!) 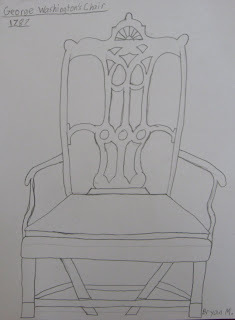 called Annechovie I was thoroughly inspired by her beautiful "chair" art, so I had my students create their own "chair" art. 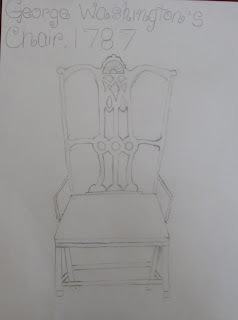 And since the students were learning about the creation of the U.S. Constitution, we decided to draw the chair that George Washington sat in during the Constitutional Convention in 1787. 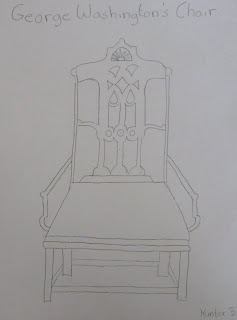 Before we started drawing the chair, we talked about the concept of "negative space". 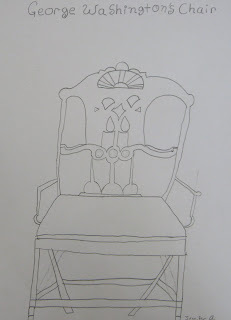 I told the students that we would be drawing the "negative space" in the chairback to get the look of the fancy pieces of wood that make the chair. I helped them understand negative space by drawing some "positive" triangles, but then turning them into "negative" spaces after enclosing them in a box. The end result is a "positive" space "X" and the triangles are negative spaces. 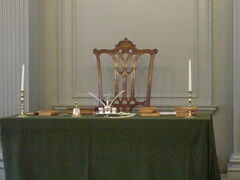 "During the convention, Benjamin Franklin wondered if the sun painted on the back of George Washington's chair was rising or setting. 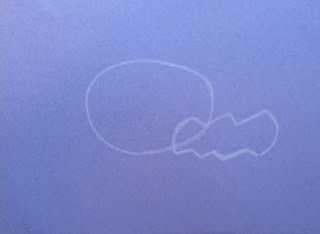 At the conclusion of the convention, Franklin optimistically concluded it was a rising sun." I loved learning about the Constitutional Convention during this lesson, and I can now say I "pretty much" understand the Electoral College. Thanks Flamson Middle School students! 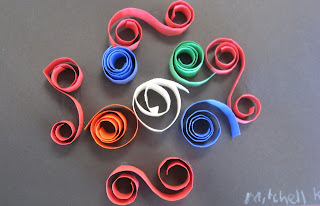 Paper Quilling* is a type of art done in Colonial times and it is a fun project that can be done with students of various ages. 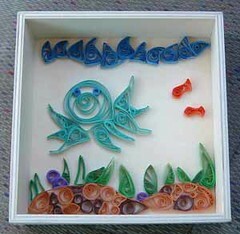 One tip would be to use wider paper strips for the younger kids. 6"x9" black background paper w/ yarn attached for hanging. 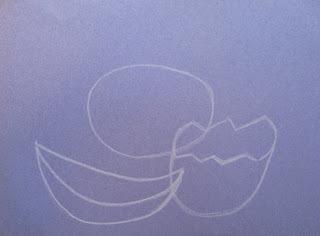 First I showed paper quill examples that I'd found on the internet. Then I created some example quills, and I drew on the board some examples of the designs the students could make by wrapping their paper around their pens. 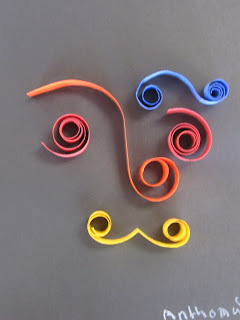 Students were told they could make a random design, or an actual subject with their quills. I also explained the importance of wrapping the paper "on top of itself". If they wrapped the paper NOT on top of itself, they would end up with an uneven quill that would be difficult to glue onto the background paper. 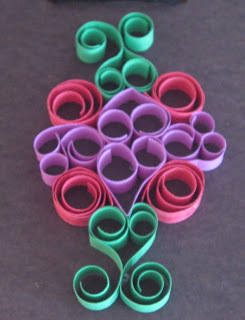 This one, below, is too uneven for gluing. 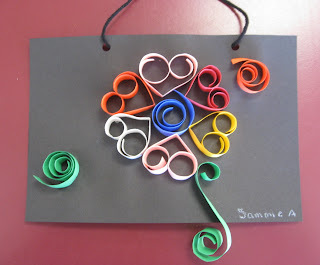 As a time management tip, I told the students they would have 20 minutes for quilling and 13 minutes for gluing. I didn't pass out the glue until after the first 20 minutes, then I collected the paper strips and students glued down the quills they'd made. Thank you Flamson Middle School students!! 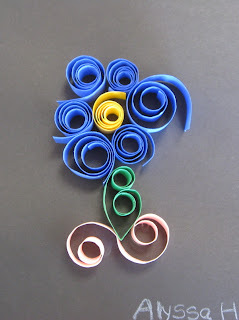 *Hey, one of my readers just shared her website on quilling - it's fabulous - tons of inspiring designs and projects. 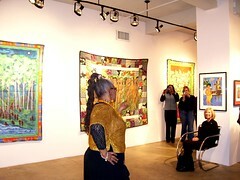 You can visit her website here and her blog here. Thanks Whimsiquills!